e stick, using the spoon make small hole in the mud and balancing the plants between spoon and fork for planting carefully. 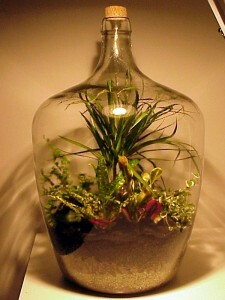 You will have to remove some of the old mud from the roots before you put plant in the bottle. Planting should be carried out with at most patience and steady hand .Watering should be done very carefully using the PVC or plastic pipe and funnel until the soil get wet. Don’t make the planting media too wet . Any dirt sticking the side of the bottle should be wiped with cotton fastened to a bent wire. You should expect some condensation each day, but it will tend to clear and reform this shows that a balance has been achieved.